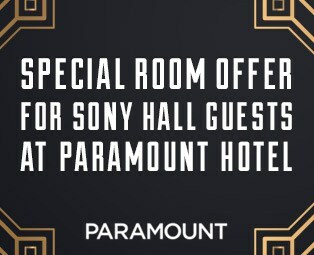 Sony Hall is located in a space that is one of New York’s most celebrated historic venues, previously known as The Diamond Horseshoe. Established in 1938 by theatrical showman and impresario Billy Rose, the Diamond Horseshoe was known for its lavish dinner theaters, vaudeville-style reviews, and chorus of showgirls known as “Billy Rose’s long-stemmed beauties.” The venue is widely recognized as giving Gene Kelly his start and was celebrated in the 1945 feature film “Billy Rose’s Diamond Horseshoe” starring Betty Grable. “Queen of the Night,” the theater show that became one of the longest running shows in Off-Broadway history, was the space’s most recent occupant. Blue Note and Sony have preserved much of the classic look and feel of the venue with select renovations.